Orientalist collector Henley Farrer (Richard Hurndall) asks his butler, Zoltan (John Hollis), if his guests are coming. He's told they arrived at the airport an hour ago. "Then they are coming... to kill me", he says. He hands an ornate dagger to Zoltan, telling him to do with it what he must, and steps into a coffin. Zoltan warns him someone's arrived then lowers the coffin. Farrer says, "We've cheated them", and closes his eyes; Zoltan places his Last Will and Testament on his master's body before closing the coffin's transparent red lid. 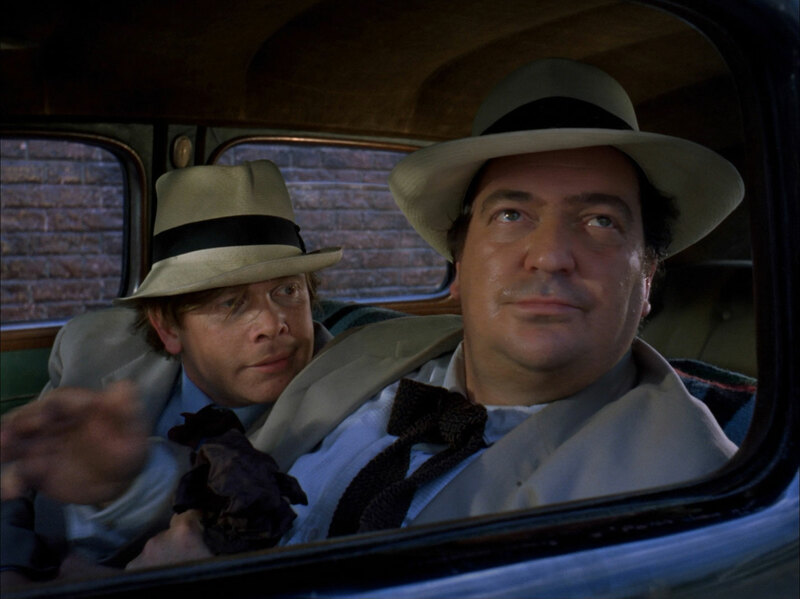 Sidney Street (Stratford Johns) and Humbert Green (Ronald Lacey) enter through the French windows, pistols drawn, dressed like 1940s Casablanca gumshoes. Sidney is greatly annoyed to find Farrer dead and snatches the will, hoping it will tell him where the Falcon dagger is. Steed is playing with a radio-controlled aeroplane when Zoltan arrives, followed by Gorky (Tutte Lemkow). Zoltan hands him the dagger, saying it was his master's dying wish that he have it, but refuses to reveal who the benefactor was. Zoltan leaves, saying he hopes Steed receive all that his master wished the dagger to bring him, and a peanut-tossing gumshoe in Fedora, pinstripes and two-tone shoes, Slattery (Vic Wise), watches him depart. Humbert meanwhile is changing a flat tyre, Sidney bemoaning that the fates are against them. Slattery and Gorky see Tara arrive - she's between parties, wearing a dove-grey morning suit and top hat and bearing a jeroboam of champagne. Tara picks up the dagger and supposes it to be Chinese, then promises to have it checked and takes it with her. 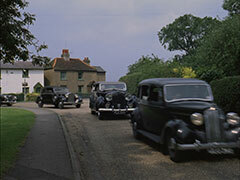 Gorky rushes back to Steed's door and Slattery crosses the street after Tara drives off. Behind him, Oppenheimer (Peter Swanwick) slips into the doorway from which he was observing. A cherry-picker turns into the street and approaches the flat... meanwhile, Humbert has got them on the road again, Sidney tossing the jack angrily out the window. Steed spots Gorky peering through his letter slot and hauls him inside, then plies him with champagne. Gorky offers him £500,000, then £750,000, then £1,000,000 - mistaking Steed's confusion for hard-nosed bargaining. Before Gorky can explain, Zoltan shoots him with an assault rifle from the cherry picker, then is driven off. Gorky warns him to "get rid of it before they kill him also", leaving Steed even more in the dark. Steed phones Dr. Winter, overheard by Oppenheimer, lurking on the threshold. 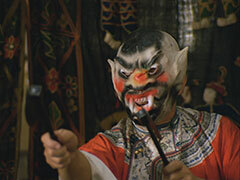 Tara visits Ho Lung (Leon Thau) and ask him about the dagger. He recognises it immediately but pretends it's a worthless trinket. He asks her to stay while he checks his books in the back room, then phones someone, asking if they're still interested in "The Dagger of a Thousand Deaths". He promises to keep Tara there until he arrives. 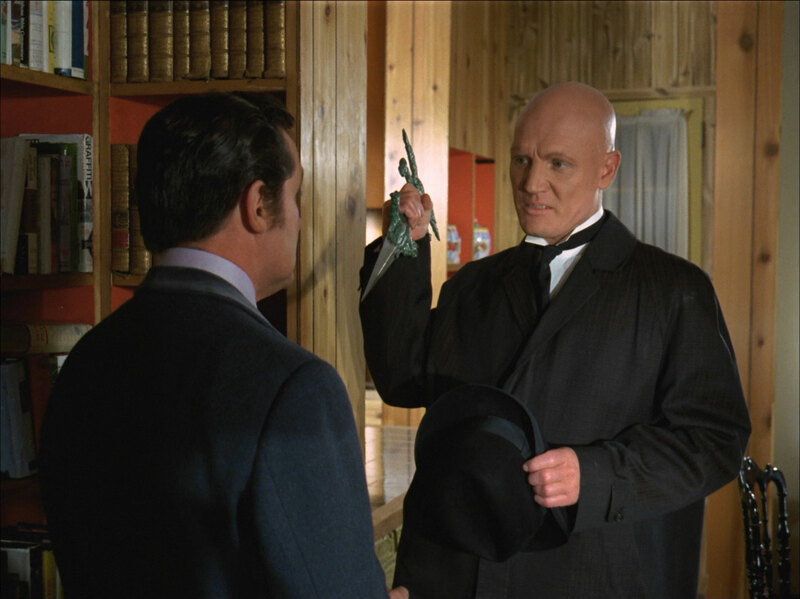 Oppenheimer knocks Dr. Winter (Michael Bilton) out when he arrives and claims to be Winter's assistant to gain entry to Steed's flat. He's show Gorky and demands "hot water, and lots of it", then starts searching Steed's desk. Steed catches him and tell him to examine Gorky and Oppenheimer pulls a stethoscope on him - then a pistol. Oppenheimer demands to know where it is and Steed, playing for time, says he'll get it. Steed spots Slattery move at the door and flings it open, the two men shooting each other, then Winter staggers in the door. Back at the shop, Ho Lung is desperate when Tara tires of waiting and takes the dagger - a Porsche pulling up just after she leaves, hurried on its way again by Ho Lung. Back home, Tara throws the dagger at a wall and hangs her coat and hat on it while outside Gregor (Romo Gorrara) gets out of the Porsche. Steed send Winter home "to see a doctor", and covers the three bodies against the sofa with a blanket. He spies Sidney and Humbert arrive, Sidney waxing lyrical about finally having the dagger in his possession. Humbert eagerly asks how he wants Steed killed, then is crestfallen when told subtlety is required. They go inside and Sidney rings the doorbell, Steed inviting them in and excusing the mess. Sidney recognises Slattery from his holes in his two-tone shoes, which Humbert compares to the hole in his own. Humbert discovers the other bodies are Oppenheimer and Gorky, which makes Sidney consider they may have underestimated Steed. He asks Steed about the dagger, and claims the "worthless trinket" used to belong to his Aunt Emilia. He spins a tale of buying it for a shilling as a present for his aunt when he was a small boy. Steed, unconvinced, says he'd love to give him the dagger, but has already given it to a friend, at which Sidney rises to his feet and asks the name of the friend, but Steed claims to have forgotten it. Tara is attacked by Gregor while Steed ushers out his guests. He rings Tara and, hearing the noise of the fight, rushes round, arriving just as she knocks Gregor out. Gregor groans and sits up, the dagger in his back. Steed sees Humbert and Sidney arrive outside so they head out the back way to revisit the curio shop. A man leaps at them from a rooftop, missing them both and knocking himself out. 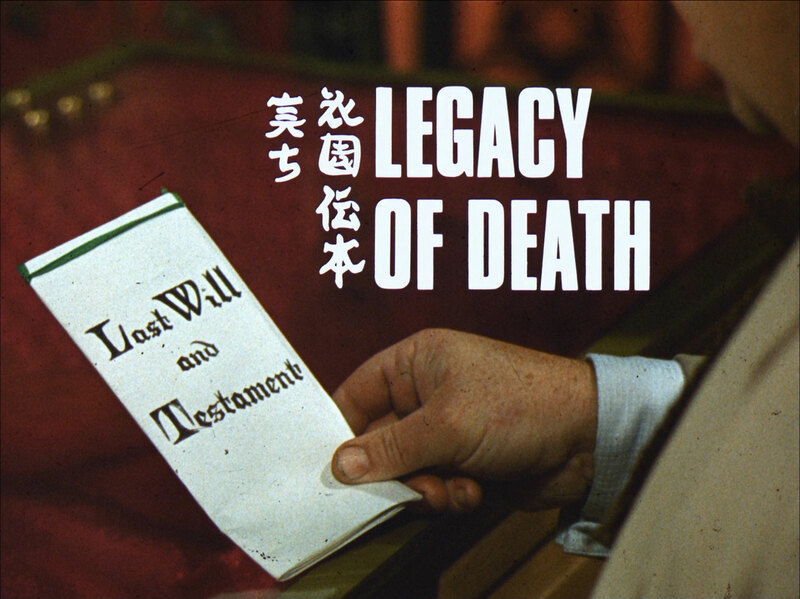 Tara bemoans the poor quality of modern assassins while Steed searches him, finding a note from a "dickens of people called Dickens". Humbert and Sidney appear and recognise the unfortunate 'Cosher' Klaus but Tara and Steed have already departed, followed by a convoy of sedate black cars. She loses them and they drive to Steed's old summerhouse, where he hides the dagger. Steed visits Dickens, Dickens, Dickens, Dickens & Dickens, where he finds only the youngest Dickens (Kynaston Reeves) still alive, and he a very old man. 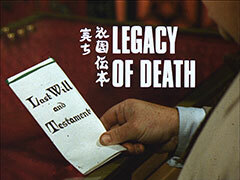 Steed asks about the bequest and Dickens starts poring over a mountain of testaments. 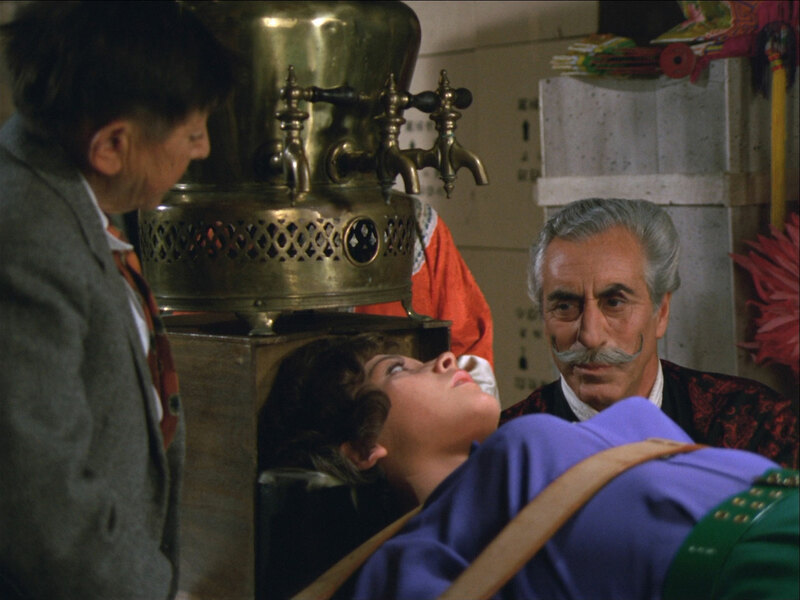 Tara revisits the curio shop - Ho Lung pins her to a crate with a hatchet and Baron Von Orlak (Ferdy Mayne) appears, accompanied by his midget manservant, Winkler (Teddy Kiss). Orlak tells her he sent Gregor to relive her of the dagger but, as he failed, he has come to claim it himself. Tara refuses him and is chloroformed, Orlak ordering the others to 'prepare her'. Dickens, meanwhile, has just realised where the bequest is when Zoltan reappears in the cherry-picker and shoots him. Tara comes to, but refuses to reveal the location of the dagger, which Orlak says has brought death to all who have owned it. She is subjected to the Chinese water torture, but midway through her interrogators are attacked by Humbert and Sidney. Sidney takes over and she leads them to the summerhouse where she overpowers them and subjects Street to another Chinese torture - tickling with feathers. Street reveals the dagger is a key to a vast fortune, left by Henley Farrer - whose name Steed has finally located at the solicitor's office. Tara breaks into Farrer's mansion and finds Steed already there. He tells Farrer was an old enemy - a liar, cheat, and cold-blooded murderer. She explains the dagger's use and Steed notices a pattern in the floor the same shape as the dagger. Tara spots a lock and Steed inserts the dagger, and under the stone they find a bed of sand. Street appears to interrupt their digging, accompanied by all the other fortune-hunters, who have formed a consortium. Sidney tells them they seek a gigantic black pearl, the most valuable in the world, whereupon Steed unearths a metal box. When Steed reveals the box to be empty, Farrer's coffin rises up and he steps out, beaming a welcome to his assembled guests. Street drops his gun when Zoltan appears with a submachine gun. Farrer informs them he knew they'd be after him once he found the pearl, so he flushed them into the open; the pursuers killing each other or being killed by Zoltan in the process. Tara throws a vase at Zoltan and pandemonium breaks loose. When Steed shoots Farrer, he drops the pearl which bounces across the floor, landing in a goblet of wine in from of Sidney. The goblet fizzes and bubbles, Sidney poking inside it to get the pearl but by the time he gets it out it's a normal size, the rest having dissolved. Steed suggests it'll make a nice tiepin and Sidney graciously takes his leave, dropping the pearl back into the goblet. Humbert whines there must be something they can steal and Sidney replies, "There comes to mind a certain bird, a statuette thing. Maltese, I believe, belonging to some brothers". Steed and Tara share the world's most expensive drink. Tara drops round to see Steed, who silences her with the words, "Roget pins left to me". She thinks it's another bequest but he explains he's finally worked out what was wrong with the model 'plane - he had the Roget pins on the wrong side. Steed starts the maiden flight, but the 'plane flies so well it goes straight through the window. Steed salutes the last of the few and Tara hands him the first of the many - a glass of champagne.